This is a choir for advanced singers who wish to sing challenging choral works ranging from symphonic music to a-cappella works. In order to ensure good musical quality it is necessary that singers attend at least 70% of the rehearsals and have a solid musical background, possess sight reading skills, have basic knowledge of vocal techniques and commit to the choir for at least one year. An audition is required which includes a sight reading test and voice check. The singers of this choir range from 18 to 40 years. In the concert series ​“Mass Compositions as an Art Form” the main emphasis in the coming summer semester will be the Mass in B minor by Johann Sebastian Bach. All choirs will perform Beethoven’s 9th symphony at the Musikverein in an optional July summer project. In December 2019 the choir will perform the challenging a-cappella Work ​“A boy was born“ by Benjamin Britten as well as ​“Daphnis et Chloe“ suite no. 2 by Maurice Ravel. 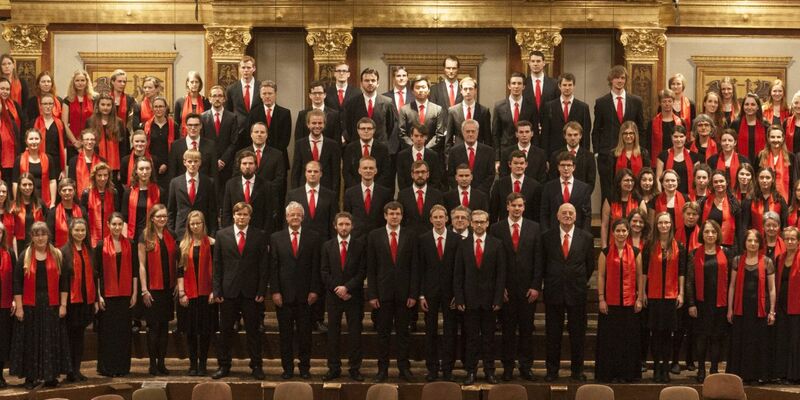 In December 2018 the choir sang parts of the Christmas Oratorio by Bach, the Messiah by Handel as well as the eight part ​“Jubilate Deo” by Gabrieli at the Vienna Musikverein. In the summer term 2018 the Mass for two choirs by Frank Martin and the Sept Chansons by Francis Poulenc were sung. In December 2017 the European premiere of Vijay Upadhyaya’s 2nd Symphony was performed. Past projects include the eight-part ​“Jubilate Deo” by Gabrieli, the mass for two choirs by Frank Martin, ​“Sept Chansons” by Francis Poulenc and the 16-part ​“Hymne” by Richard Strauss. In December 2017 the European premiere of Vijay Upadhyaya’s 2nd symphony was performed. In this choir we are looking for tenors in particular. However all voices are welcome from autumn 2019 onwards.